Language Matters! | It's In The Sauce! ← Can We/Will We Change? It’s in the SAUCE has several meanings, as some of you know from reading my other posts. One meaning is the importance of effective communication. One application of this is the importance of choosing a direct and/or indirect communication style, determined by several variables. Given its importance, the subject of communication is one we will come back to time and again. Communication is how we get along well with others, or not. 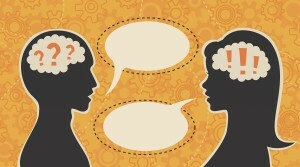 The focus of this post on communication is the language we use, and how words matter. A few examples. When you hear the word “soft,” what images come to mind? What about the word “hard?” What about the word “human?” Which of these words are normally used in a more positive manner? Which have the appropriate amount of energy and action attached to their meaning? In our society, in general, is “soft” thought of as confident, powerful, and competent? Probably not. Soft is a word that is more passive than active, creating an image of low energy, weakness and meekness. What about the word, “human?” When I asked my husband this question, he replied, “family.” Another person replied, “relationships.” These are more positive than negative answers, although there are certainly dysfunctional families and negative relationships! Most people, I believe, do hear the word “human” as humanistic and positive, and with the appropriate amount of energy and action on the part of all individuals involved, relationships can be positive and healthy. In the American society, the term, “hard skills” usually means technical skills, and “soft skills” refers to behaviors, not skills. Traditionally, more often than not hard skills have been more valued in the workplace than soft skills. I believe this has something to do with the words themselves. In a very individualistic society with management more about control than influence, it makes sense that behaviors referred to as soft would not be as valued as they need to be. Thankfully, that is changing. Many companies and organizations are moving from or have moved from an industrial management model to one of innovation and empowerment. Our language and the words we use need to follow suit. I recommend changing “soft skills” to “human skills,” and give the credit for this idea to a businessman I heard who first used this distinction in a meeting in South Africa almost 16 years ago. Since then I have consistently referred to these skills as human skills for the reasons noted above. I have tried to spread this gospel, with little success. I think the term “technical skills” should replace “hard skills.” That is really what hard skills are, and the term has no negative connotation, at least in my opinion. I now ask for your help. And please, do not consider this word smiting or unimportant. Surely we can think of other words that we have removed from our vocabulary for various reasons. Some words we no longer commonly use negate the value of others, and we have consciously removed those from our vocabulary. I see this change as equally important. As always, I am interested in your opinions about my musings. I am even more interested in you helping me make these changes. After all, what we think is important, but what we do is at least equally and maybe more, important. Thank you! This entry was posted in SAUCE and tagged communication, communication styles, effective communication, relationships, working relationships. Bookmark the permalink.